The GeForce® GTX 1080 Ti is NVIDIA's new flagship gaming GPU, based on the NVIDIA Pascal™ architecture. 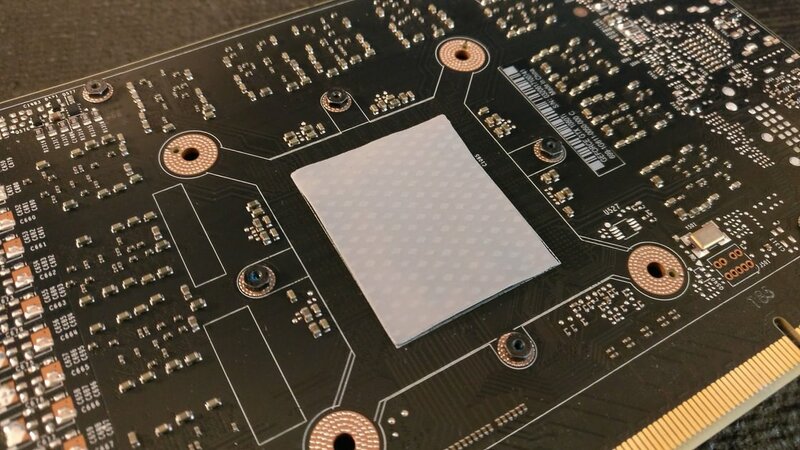 The latest addition to the ultimate gaming platform, this card is packed with extreme gaming horsepower, next-gen 11 Gbps GDDR5X memory, and a massive 11 GB frame buffer. Best BIOS Collection are the all the BIOS's I tested that give decent results. XOC is power limit free BIOS developed for L2N, still working on our FE's and other cards though. Renamed by card they come from for clarification with power limit wattage of each one in the name. Added the .bat files needed to run as Admin after each flash. Unzip NVFlash to a folder. Run an admin command prompt and cd to the folder you made. To turn protection off so you can flash the BIOS. Then to backup original bios. If screen goes black just hit the 'y' key twice, it'll flash and screen will come back on. Reboot, reinstall Nvidia driver, reboot again. For more than one card. Turn protection off. Choose the number of card you want to turn protection off, 0 or 1 for example with two GPUs. Choose the number of card you want to save the BIOS, 0 or 1 for example with two GPUs. If screen goes black just hit the 'y' key twice for each flash, it'll flash and screen will come back on. Important: Run the correct Powerlimt.bat file found in the BestBiosCollection.zip after you flash the BIOS and reboot to properly set the BIOS power limit voltage. Important! 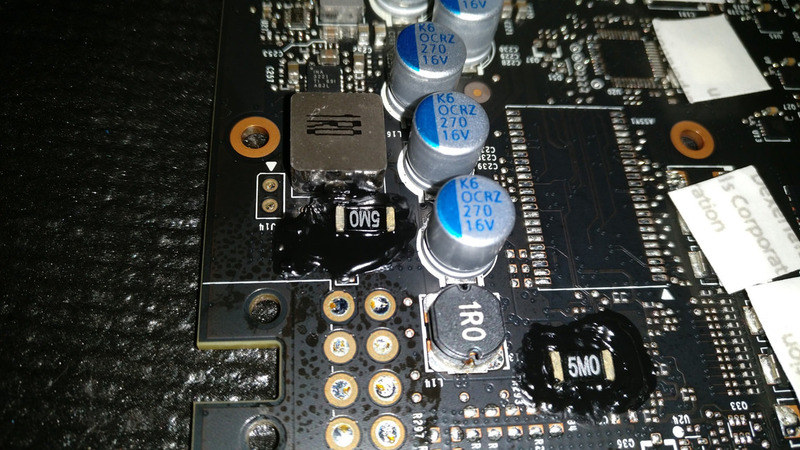 Don't flash the HOF or MSI Lightning Z BIOS's or any BIOS that uses three power connectors. They'll brick your card and unless you have a spare card or iGPU you won't be able to flash it back. Also two eight pin power connector Kingpin BIOS will brick your card. If the video is poor quality showing right in overclock.net click on YouTube at the bottom of the video, much better quality watching right in YouTube. 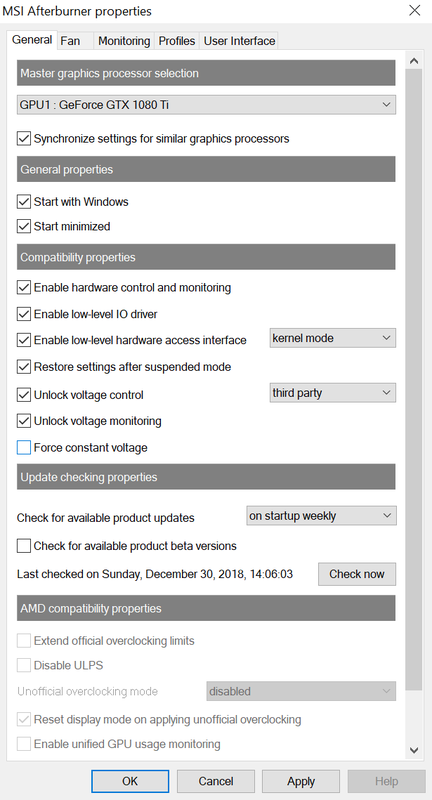 I've found after flashing a BIOS or installing Nvidia drivers the max power limit is much lower than it should be and this is the fix. Driver Uninstall Tool, (DDU) do this after flashing a BIOS, then reinstall the latest driver. Choose the Boot Into Safe Mode Option. You HAVE to know your login email or password, a four number pin won't work. Link to XOC no power limit BIOS. You don't need to run the power limit .bat file with this BIOS. Direct link To XOC BIOS from the forum post. Use below settings to unlock the voltage curve. Official BIOS's found on link below. Best Way To Do A Custom Voltage Curve. See short video for best explanation. 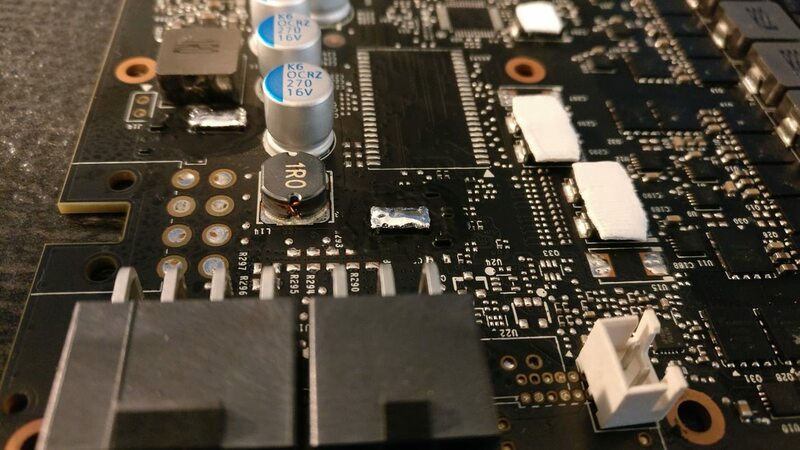 The link goes into a lot of detail on exactly the best way to get an overclock with little or no power limiting using a custom voltage curve. Edit: I was testing power limiting with the Arctic Storm BIOS. I found at 2025 core, 6177 memory at .993v my card does zero power limiting in Fire Strike Ultra, Time Spy and Superposition 4K. Also, it won't power limit on the Fire Strike Ultra stress test. Every BIOS I've tested so far seems this is true at .993v under water. My temps on a 360 RAD with a highly overclocked 5960x and my 1080 Ti never go above 43C on the GPU at these settings. But a lot of that is adding Fuji 17.0 W/mK thermal pads on the memory and VRMs and a few other key places. Normally I run 2088 core, 6077 memory because I have a 4K G-Sync monitor and I cap games out at 59 FPS to keep G-Sync enabled and capped at 59 FPS it does no power limiting at 2088 at the highest graphics settings in games. But if you run higher frame rates or have a 144Hz monitor and run it at cap you may want to consider your max clocks at .993v. Under water is great and under air it will greatly reduce temps and thermal throttling you may encounter as well. Also if you are getting 'Display driver has stopped responding' do below. It works for Windows 7 to Windows 10. Before you start running Heaven these settings in Nvidia control panel, it'll make your overclock more stable. Also in any game use Single Display Performance Mode and Prefer Max Performance, your games will be more stable with your overclock and have a more constant FPS. It'll run around 1999 core at 1.062v in Afterburner in Heaven. Don't run Heaven though, drag the 1031v point up without holding Shift to the same as the 1050v point and hit apply. If you do it right everything to the right of 1031v should be in a straight line. Try lower voltages if you are on an air cooler and want to keep temps down, though you may need to start with lower clock speeds as well. Keep your memory between +400 and +500 to start even if you can do more. Crappy video I made how to actually do the custom voltage curve. It's how to do a 1.093v voltage curve, to do 1.031v you need it to look like the voltage curve picture farther down this guide.. Since I flashed the Strix BIOS on my FE I'm getting 2100 at 1.093v with no throttling. Open Heaven at a lower resolution than your screen resolution NOT in full-screen mode so you can still see Afterburner. When you run Heaven if you get no driver crashes or screen freezing about three seconds and restarting that's good. Now raise the 1031v point with Heaven running one notch at a time to high core speeds like from +145 to +155 and hit apply, then between each time wait 30 seconds or so. Keep doing this until the driver crashes or screen freezes three seconds and Heaven restarts. Close Heaven then drop in back down one notch, hit apply, and reboot. Your frame rate and stability will be compromised until you reboot. Now do a full benchmark run with Heaven. If nothing crashes core is good. If driver crashes or screen freezes just drop it down one more notch. At 1.031v max core you can get you should get zero drops in voltages and core speed, should stay at 1.031v and the core it's at. You can have GPU-Z running and logging to see your core does not drop during the run and be sure you had no driver crashes. If core and volts drop drastically a few seconds, then resumes, your driver crashed. Ideally, this is what your final voltage curve should look like, but with the maximum core you determine by this method. After you get best voltages with maximum clocks drag each point in your voltage curve without holding Shift until it looks similar to this. After you get core stable run Heaven and hit Shift to pause it at a scene. It'll show the frame rate up top with screen paused. Stop it at a lower frame rate scene when the frame rate only fluctuates a few FPS while paused, usually a scene with no clouds or smoke or anything. Now adjust your memory up/or down until you get the frame rate as high as it'll go with no driver crashes or artifacts. HIGHER ISN"T ALWAYS BETTER. I find at +642 is a few frames slower than +610. Your frame rate may only be higher a few FPS at best memory speed but that's fine. You have now found a low voltage best clock speed compromise for your water/air cooled 1080 Ti. Being obsessive about these things, I've found under water, no shunt mod, voltage slider maxed out, the trick is to find the best clock speeds you can obtain at the lowest possible voltages for sustained voltages and core speeds. If I run my core at +177 2062 at 1.031v I get a solid 1.031v and 2062 core on a full 1920x1080 Heaven run. This is the lowest I can go on voltages with zero driver crashes at +177 core. If you look at my GPU-Z log not once did I dip below 1.031v or 2062 core. With 2093 core 1.093v it bounced up and down from 1.050v to 1.093v and in between, clock speeds changing as it does of course. So while you can brag about maximum clocks (I got 2100 benching) for every day 24/7 scenarios a balance between voltages and clock speed seems to be key. Hope this helps some. I'm reluctant to do the shunt mod as in my case my video card sits vertical and I'm not going to have the CLU run under my EK block and ruin my card. How To Maximise Your Memory Overclock. Thanks goes to @nrpeyton for suggesting OCCT. Download OCCT 4.4.2 Portable here. Uzip the files and run OCCT. Go to the GPU:3D tab and run it using these settings. If you get a User Cancelled error go into the Settings and put 'Hardware Monitoring' to 'None'. Have Afterburner open on your second screen or if you only have one screen Alt Tab to it when you need to. With OCCT GPU:3D running at those settings raise your memory +100 at a time, click your mouse back on the OCCT GPU:3D rendering window to put the focus back on it you after you adjust Afterburner and wait 30 seconds. When you start getting errors drop it down -30 at a time until the errors stop, then run it at least two minutes. Next open Heaven and run it. If Heaven stops responding and crashes lower your memory -30 at a time until the crashes stop. Then do a full benchmark. Profit!! When it comes to memory I have an exceptional card and got +723 with this method with core at 2012 at .975v with zero power limiting in benches and games. My Heaven scored 4.5 frame rates higher and Superposition scored 100 points higher with the same 2012 core. As well, in Power Option in Control Panel, put your Maximum Processor Frequency above what your max CPU speed is. Put your Minimum Processor State at 100% for benching. Also in PCI Express turn Link Power State Management Off. When benching it's better to adjust the settings in the Global settings, not per app as it can cause issues. After hitting power limits, I could not take it anymore. I knew that it was time for be to do the shunt mod. My card could bench at 2114 Mhz in heaven, and I believe it could go higher. After all, I've seen it boost to 2138 Mhz before without crashing. I found it as a OC member, it was irresponsible for me to have so much potential thrown away. My theory was that I had a pretty nice golden card. That theory was proved to me today. The shunt mod, if done right without too much CLU, will drop your 100% to 75-80%. This means that at 75%-80% you are drawing 300-310 Watts.This can be dangerous because at 120%, that is 450 Watts! Because I set out to perform this shunt mod, I need to upgrade my cooling. My x41 was nearly at its limits. The liquid temperature was at 40C and my GPU temperatures stock was at 48C. If efficiency was 100%, then liquid and GPU temperatures would be equal according to newton's energy equation. Thus, I knew there was things I could do. 1. I could improve the TIM in between my shim and heat pump. 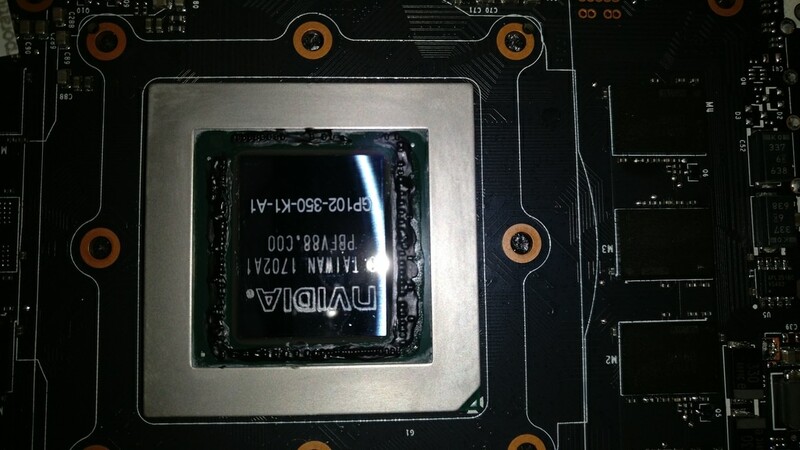 Originally, I was planning to CLU the die and other side of the shim, but after looking online, CLU is really bad for dies from a RMA stand point, it leaves stains. So I decided to just use Gelid Extreme on the die and CLU on the shim and pump. Eureka, this got liquid temperatures from 40C to 44C, this means that more heat was being transferred to the radiator. 2. The midplate is a heatsink itself. It is connected to VRMs, VRAMs and other components. If I was going to introduce more watts to this card, I need to keep them cool. Originally I had placed 8 heatsinks on my midplate. This dropped my core temperature from 51C to 48C. Taking thermal measurements, the shims were at 36C. I knew that if I added more heatsinks, specially closer to the VRMs, it would help with the extra 50 to 75 Watts. 3. Finally, the backplate was not absorbing any heat whatsoever. 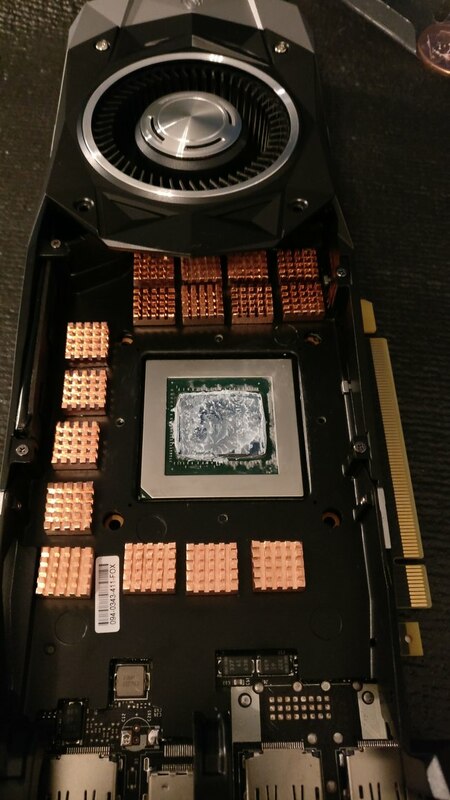 The aluminum plate is somewhat thin, my theory is that the plate was too thin to absorb heat from the GPU, it would cause warping and flexing. But using my engineering knowledge and deduction, I knew that my AIO was keeping my GPU at 48C, so 45-60C wouldn't harm the back plate at all. So I added a thermal pad in between the back of the GPU and the backplate. For my shunt mod, I used CLU and liquid electrical tape. My previous calculations were correct. From the shunt mod, running a light heaven, I was drawing 300-310 Watts at 75-80% power draw. That means at 100%, I would be drawing 400 Watts. At max, my card was drawing 95-100%, which mean I was drawing 400 Watts. This is confirmed below! Stock at 300 Watts, 48C. All my modifications have successfully fought off the incoming 100 Watts. After some light benchmarks, I can easily hit 2152 Mhz @ 1.093v with no limiting. I have decided to call it a day and spend time with my wife. I have not pushed this card to is maximum core clock yet. This card is now drawing 100 extra watts, which is very dangerous. Because I do not want a $700 paper weight, my next step is to find a balance between my maximum core clock and voltage and try to limit my power draw to 350-375 Watts. Do I recommend this mod? To people on water, yes! To people on AIO, maybe. You must take the extra steps I did to ward off that 100 Watts of extra heat that will be coming to your card. To people on AIR, No. I do not recommend this mod to people on air. It can potentially be dangerous. To people with partner cards. Maybe... you have to think about it, you're adding 33% more power and that can increase your temperatures by 33% as a rough estimate. It can be counter productive due to thermal throttling. And if you don't take extra pre-cautions to cool your card, it can blow up! Last edited by KedarWolf; 01-30-2019 at 09:23 AM. 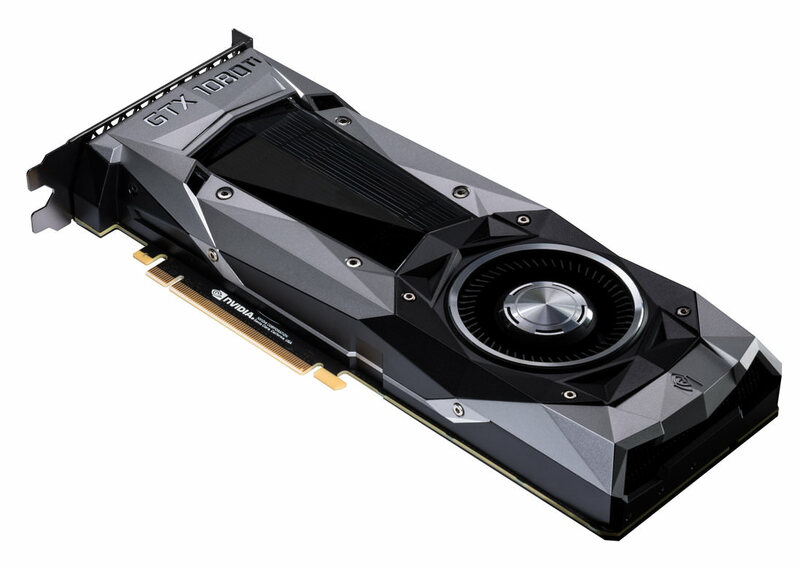 Does anyone have any experience with the delivery times on nvidia pre-orders? I don't. this is my 1st pre order with them. I did see several shipping options available. I choose the standard one since i'm not in a hurry. I think I read that pre orders will start shipping on the 10th, I can't seem to confirm that. This is my first pre order as well. How long ago did the first batch sell out? They ship from digital river. Sad to report that pre-orders are now sold out at NVIDIA. Did not last an hour! Woo I am glad I got into the preorder when I did. Contemplated getting two but decided to hold off to see if amd releases something more powerful to pop over to that. Having 290x's I can't wait for the performance increases. Ordered standard shipping as well. dude get a quad core and those numbers well latterly sky rocket. I almost got 2 as well, but I figured that it was way overkill... plus that is expensive! Ordered 1 as well with next day shipping. Should have gotten 2. I'll be selling it anyway once evga comes out with theirs.